for today we want to combine 2 elements of vintage and creatives inspirations. 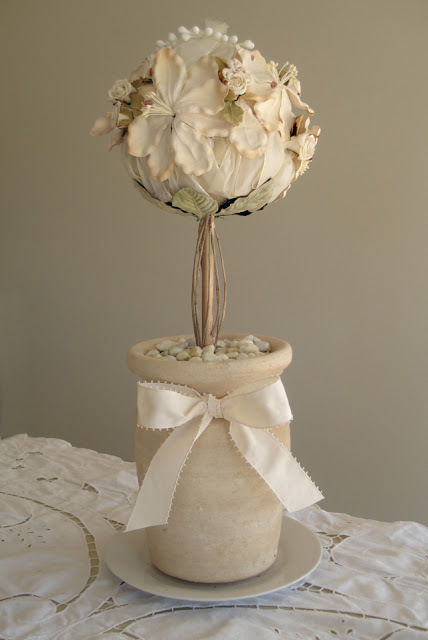 We thought its a good idea to have a floral topiary as a wedding decor centrepiece. Using vintage silk flowers and a lil touch of creativity, as it turned out, the bouquet elements themselves were quite lovely, and there were just barely enough of them to cover our foam ball. The filler for the bouquet was made of loops of crinoline bound to wire with floral tape, and we used those to cover all the empty spaces. Well in the end we were quite fond of the results of this project, and we think its not too dificult to create something similar by assembling an assortment of bouquet elements. Perhaps the the success of this topiary was due to the muted and elegant color palette, and the variety of elements. Note, if your elements aren't quite muted enough to achieve this look, try sponging on some watery creme paint, that is in fact which what we did to the leaves on the underside of the ball. a foam ball, we used one with a diameter of roughly 8"
an adventurous spirit, this is one of those projects that will take shape as you go! Determine height of dowel. Standard topiary proportions are 2:1:1, the ratio of head height to visual stem height to container height. Assuming that your dowel will sit at the bottom of the pot, and pierce the foam ball almost to the top, your dowel height should be (height of pot x2) + height of ball. If this is confusing, so just eyeball it! Cut dowel to the proper length and spray paint gold. Prepare plaster of paris according to package directions, and fill the container with the wet plaster to about 1/2" (1.3cm) below the rim. Insert the cut dowel into the center of the wet plaster, making sure that the dowel is straight when viewed from all angles. Hold the dowel in place until it is secure, about 3-4 minutes. Allow plaster to continue to harden for at least an hour. Impale the foam ball on the dowel, pushing with even pressure until the top of the sphere just meets the top of the dowel. 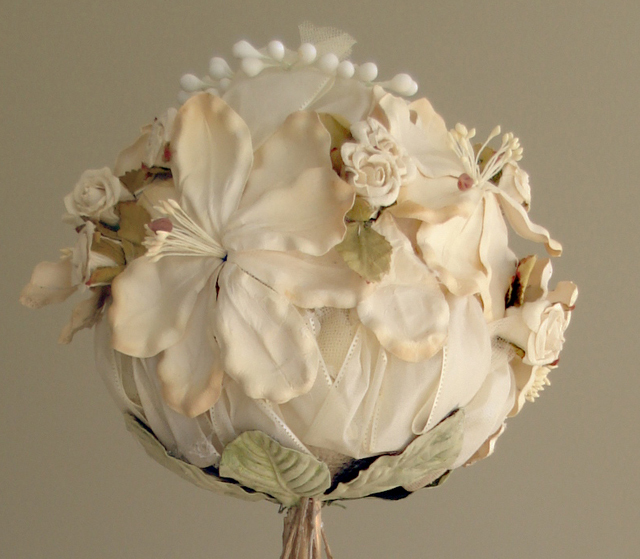 Using a glue gun decorate ball with floral elements. Partially conceal dowel with small twigs (see photo) and cover plaster with moss or small stones. Tie a bow around the pot if desired, and enjoy! Note: if you decide not to use plaster of paris make sure your pot is weighted and that the dowel is very securely glued into base. If your topiary head will be heavy we highly recommend using the plaster of paris, we have tried to skip this step and ended up with wobly topiaries, a centerpiece designer's worst nightmare! Enjoy and please share with me anything you create using this tutorial!